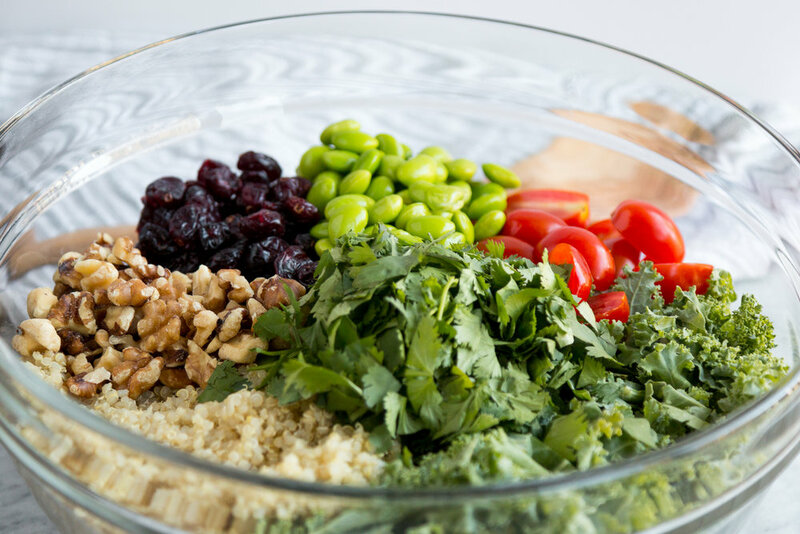 Spring into season with this crisp and simple plant-protein salad! Here in Minnesota, the Spring season seems to be a little shy in making an appearance this year. It still feels like Winter to me with its sporadic snowy days. Don’t get me wrong, the snow is lovely but I’m ready for a change. Which is why I decided to bring Spring to my home with this colorful, tangy, garlicky, healthy vegan salad packed with ‘good’ fats and plant-protein. April is also considered National Soy Foods Month, so I’m celebrating by adding some edamame soybeans to this quinoa salad. Soy foods continue to be a controversial topic and I want to take this opportunity to clear some misconceptions. Soyfoods have isoflavones, which have a similar structure to that of the hormone estrogen (1). Soyfoods are not the same as estrogen though. Both estrogen and isoflavones found in soy bind and activate estrogen receptiors (ERs) on cells in our bodies (1). Isoflavones don’t just bind to any of these receptors, they are selective, which makes their function in our bodies much different to that of estrogen. This distinct function is what makes soyfoods provide several health benefits. Studies have shown that individuals who consume soyfoods have a lower risk for breast cancer, have improved cognition, lower LDL (or “bad) cholesterol, and prevent prostate cancer (2). With so many great benefits, there’s more reason to include soyfoods in our diet – especially that of a vegan diet. Soy is a great source of plant-protein, provides omega-3 fatty acids, and is so versatile when preparing meals. This quinoa salad with edamame beans is a great option for a simple, tasty and perfect weekday meal! It pairs perfectly as a side dish to a meal but can also serve as a main entrée salad. You can also include it in your meal prep to have as lunches for the week. I know you will enjoy this plant-protein rich salad. Crisp veggies, fresh herbs, and a nutty taste tossed with a simply garlicky dressing. In a medium pot, place quinoa with 2 cups of water and cook on medium heat according to package directions or for about 20 – 25 minutes. Allow to cool for about 5 – 10 minutes once fully cooked. In the meantime, prep the remaining salad ingredients and add them to a large mixing bowl. Vinaigrette: In a small bowl, add all ingredients and whisk together. Adjust taste with salt, pepper, and/or more lemon juice (I added a tiny bit more lemon juice). Then add the cooked quinoa to the veggie mixture in the large bowl and mix well. You can pour the dressing over the entire salad or individually add**. * My edamame beans were frozen in pods. After defrosting it for a couple minutes in the microwave, I individually took out the edamame beans. Time taken to do this is not included in total time of the recipe. ** At this time, you may add any of the other ingredients you wish to have more of (i.e. tomatoes, walnuts, cranberries).